Plan and organize every aspect of your Zone Diet. Is there a better alternative to Health Calendar? Is Health Calendar really the best app in Health and Fitness category? Will Health Calendar work good on macOS 10.13.4? Health Calendar... Following the Zone Diet may be often hard and boring. To plan your meals you have to do lots of calculations. If you are tired from all these hassles each and every time you want to eat something, Health Calendar is what you need. With Health Calendar you can plan and organize every aspect of your Zone Diet with just a couple clicks of your mouse. Health Calendar needs a rating. Be the first to rate this app and get the discussion started! 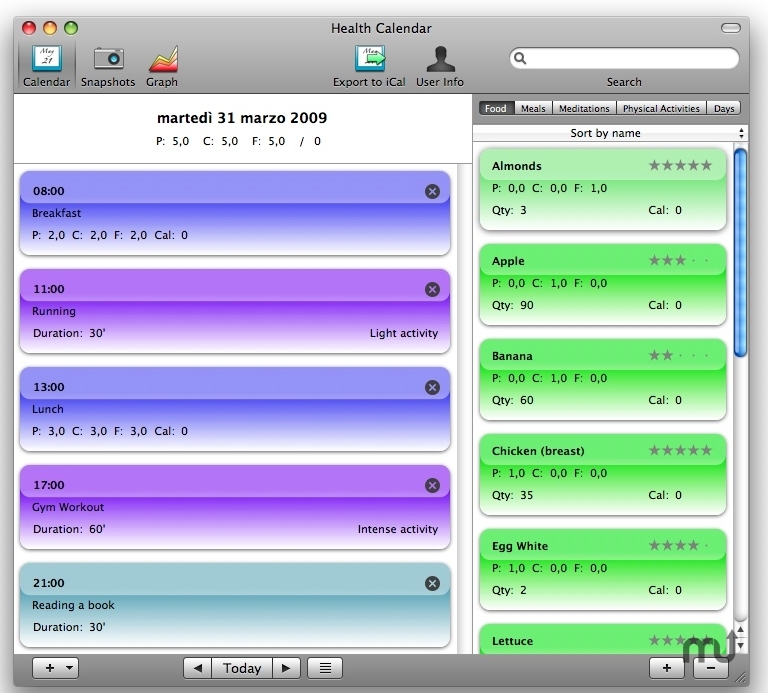 In Health Calendar you have all you need to organize your diet at your fingertips, with an easy and polished interface. You can organize your calendar, food, meals, meditations and physical activities with just a couple clicks of your mouse. You can easily add or remove items, save them, sort them using different parameters, and reuse them every time you need. This is all done with drag and drop, so typing is reduced dramatically. Save and reuse food, meals, meditations, physical activities and entire days with just drag and drop; - Monitor your physical progresses with graphs; - Export your diet to iCal to keep it in synch with your mobile devices.